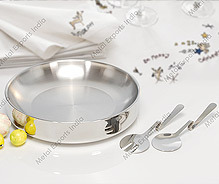 The flawlessly crafted and designed double wall bowls and trays indeed adds a sparkle to the joy of serving family and friends during social get-togethers and on special occasions. 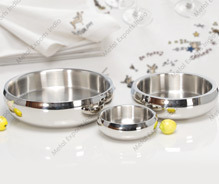 Made available in rich shiny stainless steel finish, their smooth appealing designs make them on the wish list of one and all. The quality steel choice also ensures these last for a life time as well as meets the demands of easy washing and maintenance. Add sparkle to your seasonal get-together with this sophisticated double wall serving bowls. It's not only beautiful, but functional too. This bowl features flawless finish that will last for life time. The smooth curves make it easy to wash or clean. 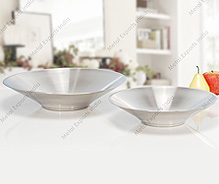 This set of double wall salad bowls features clean cuts and simple design that reflects modern world of artistry. The durable serving piece will resists stain penetration. 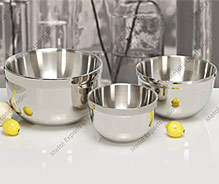 With a thick rim, double wall salad bowls allow you to stir and toss ingredients easily. This set of double wall belly shape serving bowls are perfect for everyday decor or special occasions. 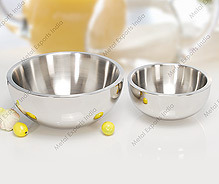 Made of stainless steel, this double wall serving bowl features a very chic, modern design! 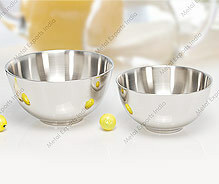 The generously sized bowls makes a perfect statement as a serving piece or countertop fruit holder. Crafted in a traditional German style, this set of double wall serving bowls will serve your guests beautifully. The double wall insulation holds the heat for an extended duration of time. This smart collection perfectly defines your personal space. For sheer style and dynamic impact, the double wall fruit tray is specially designed to revive the traditional style of royal dining. It will add a piece of conversation to any table and is ideal for holding fruit. The heavy base provide ultimate stability on the flat surfaces. 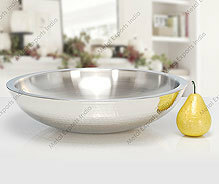 Enhance your living space with this stylish double wall belly shaped fruit tray. This beautiful fruit tray can be used as a decorative element in your home or to display & serve canapes and fruit. Easy to wash and dishwasher safe. The beauty and versatility of double wall fruit tray makes it perfect for use in restaurants and home. Playful design and casual nature of the tray compliments a wide variety of styles and environments from traditional to contemporary, and is the quintessential transitional style for formal, informal and casual use.